The Iroquois or Haudenosaunee (people of the longhouse) were amongst many First Nations People who played the game of lacrosse as a medicine, for resolution and to entertain and show gratefulness to their Creator. The Iroquois consists of six affiliated nations, the Mohawk, Oneida, Onondaga, Cayuga, Seneca and the adopted nation of the Tuscarora. These nations referred to the game as tehotshikwa’eks (day ho ji gwa eks) meaning “they bump into one another”. The game of lacrosse originated amongst the Iroquois people at the time of creation, at a time when the Creator sent a messenger to his people to provide them with life instructions. The messenger who came from the heavens or “sky world” appeared before the people and provided them with a way of life, a way to give thanks to the Creator. 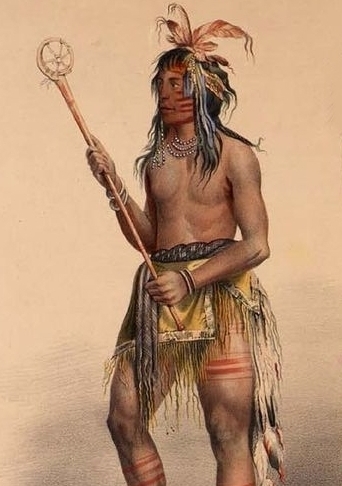 The messenger lived amongst the Iroquois people and taught them how to conduct ceremonies of thanksgiving for the many gifts that the Creator has given. The Iroquois were instructed to be grateful for their life sustenance such as corn, beans, squash, the strawberries, and also for the sun, moon, and thunder who all serve great purposes for continuation of life. To this day, the Iroquois Nations continue playing the traditional medicinal games for curing rites. During these ceremonial games the men must use wooden sticks with all natural netting made from leather and animal skin. The Iroquois hold the game of lacrosse in the highest esteem since it was given to them simultaneously with the Four Sacred Ceremonies. This is the purpose and reason that so many young Iroquois men play the game with such heart and willingness. Today, the game is often referred to as “Tewa’araton” (day wa a la doh) which is the Mohawk word which refers to the netting of the stick.